When it's one of the most important moments in one's life, you would obviously search for the best location to host it , if there is paradise on earth there is Maldives. A Wedding in the Maldives is as unique as it can get , it will sweep you off your feet and give you an experience that you will cherish forever and ever. 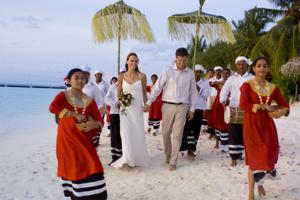 Standing barefoot on the beach as you let the sea waves provide you the back ground music while fully attired traditional drum beaters announce the arrival of the bride and the groom. Under a thatched pavilion you would affirm your vows. The resort hotel' s chef is more than happy to show culinary talents. and you have a magnificient banquet. A surprise sunset cruise for the guests with flowing champagne and in-villa treats and spa packages are the hotels way of saying thank you.